I’m getting sick of Windows 10’s auto-installing apps. Apps like Facebook are now showing up out of nowhere, and even displaying notifications begging for me to use them. I didn’t install the Facebook app, I didn’t give it permission to show notifications, and I’ve never even used it. So why is it bugging me? Windows 10 has always been a little annoying about these apps, but it wasn’t always this bad. Microsoft went from “we pinned a few tiles, but the apps aren’t installed until you click them” to “the apps are now automatically installed on your PC” to “the automatically installed apps are now sending you notifications”. It’s ridiculous. This is all thanks to the “Microsoft Consumer Experience” program, which can’t be disabled on normal Windows 10 Home or Professional systems. That’s why every Windows 10 computer you start using has these bonus apps. 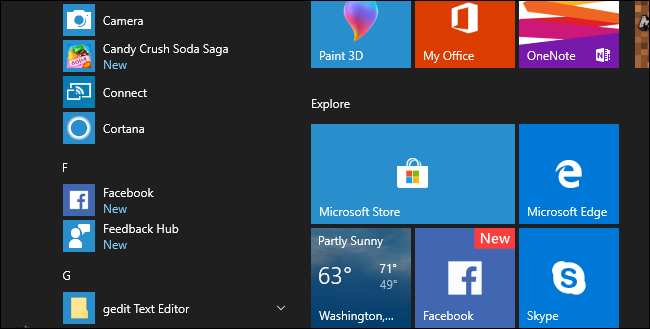 The exact apps preinstalled can vary, but I’ve never seen a Windows 10 PC without Candy Crush. The Microsoft Consumer Experience is actually a background task that runs whenever you sign into a Windows 10 PC with a new user account for the first time. It kicks into gear and automatically downloads apps like Candy Crush Soda Saga, FarmVille 2: Country Escape, Facebook, TripAdvisor, and whatever else Microsoft feels like promoting. You can uninstall the apps from your Start menu, and they shouldn’t come back on your user account the same hardware. However, the apps will also come back whenever you sign into a new PC with the same Microsoft account, forcing you to remove them on each device you use. And, if someone signs into your same PC with their own Microsoft account, Microsoft will “helpfully” download those apps for their account as well. There’s no way to tell Microsoft “stop downloading these apps on my PC” or “I never want these apps on this Microsoft account”. There is, technically, a way to disable this and stop Windows from installing these apps…but it’s only for Windows 10 Enterprise and Education users. Even if you spent $200 for a Windows 10 Professional license because you want to use your PC for business, Microsoft won’t let you stop the “Consumer Experience” on a professional PC. The group policy or registry setting that disables this feature originally worked on Windows 10 Home and Professional in the November 2015 update when Microsoft originally added the Consumer Experience. But Microsoft went out of their way to make Home and Professional ignore this setting in the Anniversary Update. Now, only Enterprise and Education respect that preference. It’s one thing for Microsoft to say “those apps just use a tiny bit of space, so what’s the harm?” But when the apps are installed by default and begin nagging you with advertisements (I mean notifications), it’s just too much. This demonstrates a deeper problem with Windows 10’s app permission system, too. All apps get permission to show you notifications without asking you, even if Microsoft installed them on your PC against your wishes. You can disable notifications for an individual app, but all apps get permission to send them when they’re installed. On an iPhone or iPad, apps don’t get permission to show you notifications until they ask you nicely. Maybe Microsoft’s permissions system would make sense if they Windows 10 didn’t automatically install apps on our PCs. But, since Microsoft is going to force these apps on us, the least they could do is make them ask before sending notifications. Microsoft has even caused some problems for users with this feature. Microsoft previously bundled the “Keeper” password manager with Windows 10, which prompted users to install a browser plugin. That plugin had a bug that resulted in “a complete compromise of Keeper security, allowing any website to steal any password”, according to Google security researcher Tavis Ormandy. The security flaw wasn’t actually in the Keeper app Microsoft installed, but in the Keeper browser extension it asked you to install. In theory, almost everyone who uses a password manager would likely install its corresponding browser extension, since that’s what makes password managers useful. Look, we get it: bugs happen, and Keeper has since patched the hole. But this story demonstrated how Microsoft is pushing products it isn’t responsible for, and that isn’t a great thing. How much due diligence does Microsoft perform on the apps it chooses to install on users’ PCs? We really don’t know, as Microsoft won’t say what standards it holds these apps to or why it makes decisions to install the ones it does. What is the VPN they have installed with it automatically set to unmetered usage? When did I ask for my files to automatically be added to their OneDrive? I WANT TO CHOSE WHAT GETS INSTALLED ON MY TABLET. I feel like my device has slowly become taken over by Microsoft. Surely this should be covered in some way by data privacy/GDPR/ some other regulatory body? I have no idea what all these new programs and features are that they have automatically installed. It even switched on paid dial up service – when did I agree to that Microsoft! Well in that case you need to secure everything, Microsoft will never install anything without your permission you need to check your privacy setting. some apps are inbuilt like popular apps like Facebook and twitter, still you can disable all unwanted apps. I have Windows 10 and Office 365 on my Surface Pro and is used approximately 8 hours a day. If you are NOT a technical type person, then I would suggest that you and your Windows 10 pc take a trip to your local whole in the wall computer shop and have them show you how to setup your pc in order not to have any issues or problems. Remedy: Go into settings and in the search box, enter “notifications”. You will find more control than you can imagine. If only Android and IOS had this much flexibility built in; especially since the carriers force feed apps to you that some are even hidden. Also , when you are in your browser and choose to download an app, make sure to look very carefully you are not going to be slammed with another app you don’t want. Example: when updating Adobe, they conveniently have a check mark in the box for you to receive an anti-virus app. Make sure to uncheck the box. One more setting: Make sure under settings you have install apps from Windows Store only. I hope this helps you with Windows 10.